Are you looking for a little ancient stimulation to brighten your day? Then an organic boost from maca powder could be for you. Maca has been used for thousands of years by the ancient Inca tribes of Peru. Maca makes a great start to your day, it mixes easily with water and blends well into smoothies to give you an organic nutritional boost. *A source of zinc, which contributes to normal fertility and reproduction. 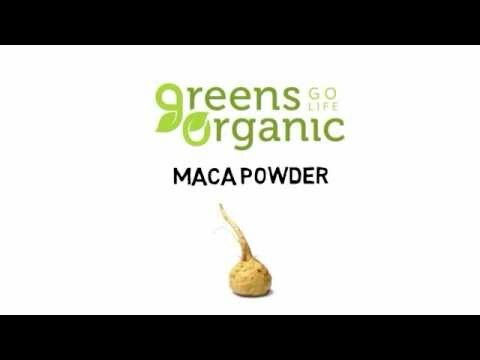 Golden Greens Fact: Maca's also been the subject of research in the realms of fertility, sexual and menopausal health. Studies have been published in The Journal of The North American Menopause Society, and the Asian Journal of Andrology. Our organic Maca is grown in the pure, organic lands of the Andes Mountains and is a sustainable source of income and development for the cooperative of local farmers. Ingredients: 100% Pure, Certified Organic Maca Powder. Sexual Health... For your sexual health, the Zinc in Maca contributes to normal fertility and reproduction. Reduction of tiredness... You enjoy life more when you're full of energy, and vitamins B2, C and Iron, contribute to the reduction of tiredness and fatigue. Vitamins B2, C, and Calcium, and Iron, contribute to normal energy-producing metabolism, and Iron contributes to normal oxygen transport in the body. Skin, Hair & Nails... Vitamin B2, Zinc and Iodine contribute to the maintenance of normal skin. Copper contributes to normal hair pigmentation and to normal skin pigmentation. Vitamin C contributes to normal collagen formation for the normal function of the skin and gums. Mental Health... For your mental health, vitamin C contributes to normal psychological function. Iron and Iodine contribute to normal cognitive function, and Calcium contributes to normal neurotransmission. Heart & Blood Pressure... Potassium and Calcium support normal muscle function, and vitamin B1 contributes to the normal function of the heart. Potassium also contributes to the maintenance of normal blood pressure. Iron contributes to normal formation of red blood cells and haemoglobin. Vitamin B2 contributes to the maintenance of normal red blood cells, and contributes to the normal metabolism of iron. Calcium contributes to normal blood clotting. Physical Health... And for your overall physical health, Vitamins B2, C, Copper, and Potassium contribute to the normal function of the nervous system. Vitamin C, Copper, Zinc and Iron contribute to the normal function of the immune system. Zinc and Calcium contribute to the maintenance of normal bones, and also protein contributes to both a growth in muscle mass and to the maintenance of muscle mass, while potassium contributes to normal muscle function. Maca is also a natural source of antioxidants including vitamins B2, and C, which contribute to the protection of cells from oxidative stress. "Love the quality of the packaging and really feel like it's boosting the health of myself and my family." - Katrina. Mixing easily with water or smoothies - a source of zinc, which contributes to normal fertility and reproduction.